Chocolaty. Creamy. Nutty. Fudgy. Perfection! Is it cheesecake or is it fudge?? Either way, I know you are going to love it! Enjoy this sweet treat without all of the sugar but with all of the flavor. This recipe is delicious as listed but can be modified to fit your specific dietary needs and goals. Here are a few modifications that I KNOW will work. If you modify it in any other way, please let me know in the comments below. Sweetener: Use any sweetener you choose. Be sure to check out THIS post about why I use stevia and VERY small amounts of either raw honey or organic coconut sugar in recipes. Chocolate: I used part unsweetened chocolate and part 70% cacao chocolate chips. You can also use your favorite dark chocolate candy bar, cut up. I do this so that the chocolate is not bitter. If you really like dark chocolate, you can use all unsweetened chocolate and omit the 70% all together. Again, use whatever chocolate you have on hand. I use the combination of unsweetened and 70% to keep the carbs down. Milk Chocolate: If you can handle the carbs or don’t really like dark chocolate, feel free to use your favorite chocolate in this recipe. Just be sure to taste your fudge before adding any more sweetener. Nut-Free: For nut-free, substitute raw sunflower seeds, pumpkin seeds or coconut flakes. Dairy-Free: If you are looking for a dairy-free fudge, be sure to check out my cookbook, Satisfying Eats, for my awesome Refrigerator Fudge! 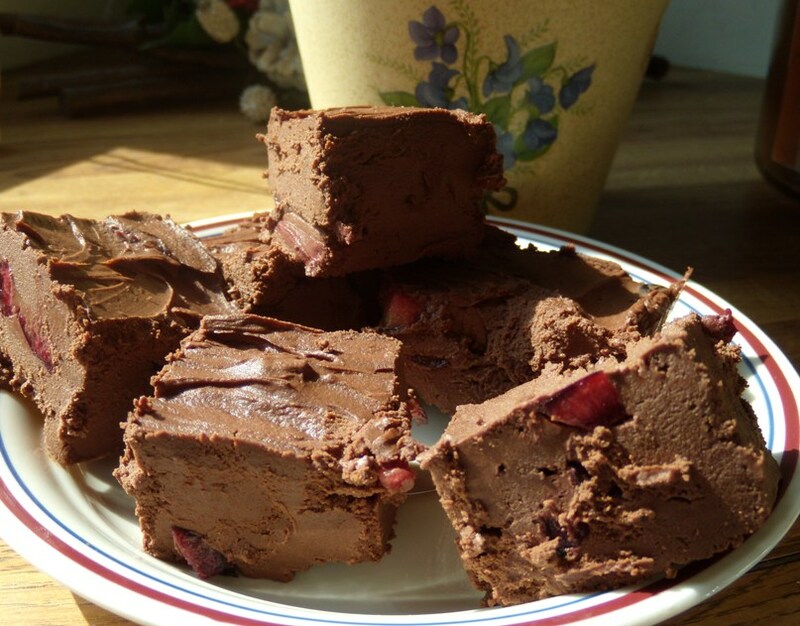 Fruit: Consider adding chopped strawberries or cherries to your fudge instead of nuts. Smaller batch: Feel free to half this recipe if you don’t need so much goodness! 🙂 The fudge batter is pretty thick so just pour it into one side of the lined loaf pan if you still want thick fudge. Bite size portions: Divide the prepared fudge mixture into mini cupcake liners using a 1-1/2 tsp. scoop. Refrigerate. This also makes the fudge less messy. Extracts: I only added vanilla extract but you could also use almond extract for a slightly different flavor profile. Also feel free to use mint extract for a peppermint patty fudge! Last tip, if you want an even firmer fudge, reduce the amount of cream cheese to 6 oz. This will make the fudge set up more firm. Also consider eating it straight out of the freezer for a nice, cold fudge treat! I hope you enjoy and thanks for sharing! Lightly oil a standard size loaf pan before lining it with plastic wrap. Set aside. Prepare double boiler (or place a large glass bowl over a pot of simmering water like THIS). Add all of the chocolate (unsweetened and chips) to double boiler and allow to melt, stirring frequently. Once chocolate is almost melted, carefully remove top of double boiler (containing chocolate) and continue to stir until all of the chocolate is melted. Allow to cool slightly while preparing other ingredients. In large bowl, blend softened butter and cream cheese until smooth. Add partially cooled chocolate to the butter-cream cheese mixture (chocolate shouldn't be hot) and blend well with hand mixer. Add stevia and vanilla and blend well. Taste for sweetness and adjust if needed. Stir in half of nuts. Pour the fudge mixture into the lined loaf pan and spread it out evenly (consider hitting the pan on the side of the counter). Top the fudge with the remaining chopped nuts. Refrigerate for atleast minutes or longer before cutting into smaller pieces. Keep fridgerated until ready to serve. This looks like an amazing fudge. I will try it but will half the recipe – just to make sure my DH likes it. I hope you enjoy! I actually made half the recipe… I don’t need 20 pieces of fudge! Enjoy! Thanks for the BIG recipe with lots of servings! I need more like that. I have a big family but also I’m often left not knowing what to bring to a party because all the low-carb and gf recipes have so few servings. This looks so amazing, cannot wait to make it! I hope you enjoy Sarah! I made a full-batch last night and even after sitting in the fridge all night, my fudge is still very soft and isn’t setting up as much as I’d like. It’s consistency is more like a rich and VERY cream frosting with nuts in it. I’m wondering if the 3/4 cup of butter is too much? So you know, I even meausured the butter and chocolate by weight to make sure the ratios were accurate. Hmmm Jenn…. It won’t be hard-hard like traditional fudge but it should be firm enough after being chilled to cut as you can see in my picture. I just double checked my amount of ingredients and everything is a match. I did intentionally add the extra butter to cut the cream cheese flavor. All the ingredients (butter, cream cheese and chocolate) are pretty firm when completely cooled so I am wondering what could have went wrong. If you want “harder” fudge, cut back on your cream cheese by 2 oz. Maybe you would like that texture better. I hope this helps! Thanks, Melissa. It is really good fudge. I don’t need it to be VERY firm, but it doesn’t have much “bite” to it. I will try cutting back on the cream cheese a little next time and let you know how it turns out. I’ve been craving extra fudgy brownies lately, so making this instead is definitely hitting the spot! 🙂 I’m so thankful for all your recipes! On here and in the Satisfying Eats cookbook. They’ve made it so much easier to switch to the Very Low-Carb, Grain-free, Starch-free and Sugar-free lifestyle!!! Now I just need to get Comforting Eats, too.. and I’m definitely looking forward to your 3rd! It’s perfect if you eat it straight out of the freezer! 😉 I froze half of the batch I made and it was the perfect consistency and lovely to have it extra chilled! I made this fudge earlier this afternoon and just now cut it into individual portions. I used the 100% chocolate bar and 70% chocolate chips. I omitted the nuts and used fresh chopped cherries (yes, I found fresh ones in the store today!) because we have nut allergies in the house and chocolate and cherries just go so well together! I found the taste to be very much like biting into an 80%+ piece of chocolate – just the way I like it!!! Yes, it does not set up hard like those sugary recipes I used to make long, long ago but the texture is great in my opinion. I don’t have a large loaf pan like is indicated in the recipe, so I put it into a Pyrex 6 cup rectangular pan that measures 6.25 X 8.25 and it worked out great. As you can see in the picture the pieces are not thin or wimpy looking. Yes, I made the full recipe and I’m going to try freezing some to see how they hold up when thawed. Since yesterday, when I made this fudge, it has firmed up more in the fridge. Good to know it freezes well. Mine firmed up enough in the fridge by the next morning to cut into cubes okay, too. It just took longer than the 30 minutes that the recipe originally called for. I still prefer the texture of it frozen. It’s like frozen custard! Yum!!! Mine was firm enough to cut yesterday afternoon. I was just noting that it firmed up more over night. Still good to know it freezes well. Might be an odd question, but I had a bad experience once. Are you using the tiny powdered concentrate from Trader Joes or the liquid stevia? Are they equal to each other? I am a very seasoned baker, but I tend to use mixes of stevia glycerite and Swerve. I love stevia, but I feel like I’m always taking a risk with it! I have three kids under 3 and I hate to mess up a whole recipe! I used liquid once in some fudge and I had to turn it in to a giant cake to get the bitter taste away lol. Thanks for all your recipes! Just made the Strawberry ambrosia cake for the millionth time! Again, I must ask what equivalent to sugar you’re using. Is 1/2 teaspoon of TJ’s stevia the same as 1/2 cup sugar? That’s how KAL measures out, but I don’t know if different brands of stevia are consistent that way. When I create a recipe, I ALWAYS says “sweetener equivalent to [x amount] of sugar” so people can use whatever they want, and I don’t have to worry about translating measurements from one sweetener to another. How much Is 1/2 teaspoon of TJ’s stevia equivalent to for Truvia? See the problem? Sorry but I don’t give “sweetener equivalent to x amount of sugar” in my recipes. Stevia is SO sweet and every brand is SO different and there are a bazilllion different sweeteners that as soon as I say an amount, someone will use too much and the recipe is ruined and I am blamed. Sounds silly but this happened. Also EVERYONE’s taste buds are so different, some like sweet and some like not so sweet. For my taste, I used twice as much organic Trader Joe Stevia than I did Kal. If using a different sweetener starter with a small amount and add more to taste. This is not scientific but it works every time. After doing this for a few recipes you will see a pattern like if I say 1/2 tsp. Organic Trader Joe Stevia and you may use 1/4 cup Truvia. I am only guessing at this equivalent. I know you are wanting exact measurements but I don’t think that exists for the reasons I have already given. I really am trying to help but you will be able to answer this question easier than me after making a few recipes and seeing the pattern. I hope this helps. Danielle, what sweetener did you use? Did you use all unsweetened chocolate? Try adding more cream cheese or beating in some heavy cream and more sweetener. I hope this helps. I used Now Foods Stevia, and otherwise followed the recipe exactly. I will try your suggestions and hopefully it can be saved! It is all solidified at this point, do you think it would be safe to reheat the whole batch in a double boiler? Danielle, with most (if not all) stevias you can’t use too much because it will make the recipe bitter (this could be the case). Try melting some of it to see how it does. I hope you can salvage it and maybe use another sweetener or more dark chocolate vs. unsweetened chocolate next time you try it. Good luck! Does this recipe really only call for 1/2 teaspoon of stevia, or is that a typo? Anne, using Stevia Select, 1/2 tsp. always start with less and add more if you feel uncomfortable heading that much. I made this yesterday and refrigerated overnight. I cut it up this morning and it was a bit crumbly. Do you know what I might have done wrong? Not sure why it would be crumbly. Maybe let it set out for 30 minutes and then try to cut it again? Do you think you could sub out the chocolate for peanut butter and made a peanut butter fudge instead of chocolate?? Lori, I am not sure. I don’t think it would set us without the chocolate. Maybe make a very small batch and try and maybe keep it in the freezer. Thank you, Melissa! I have made this at least 5 times now and I think it’s divine. It always turns out great for me. Between this, your mini cheesecakes, and chocolate chip cookies I’m able to stick to a low carb lifestyle and not feel deprived because I get a treat that actually tastes GREAT once in awhile. You are a lifesaver!!! Love your recipes!, but I haven’t been getting your newsletter in a while, would love to receive your newsletter and get new great new recipes!. Hi Kelly, I’m still here. I haven’t sent out the newsletter in a while. Been so busy with the kids. Hope to update everyone soon.